Gulkhand is a sweet preserve of rose petals from north india..Gul means flower,and qand/khand means sweet in Arabic..
Rose petals being prepared for gulkand..Place the rose petals and sugar in layers in a wide-mouthed airtight glass jar. Place this jar in sunlight for 6 hours per day for around 3 to 4 weeks. On alternate days, the contents of the jar should be stirred with a wooden stick. The jar should be kept indoors once done. Other ingredients, such as silver foil, Praval Pishti, cardamom seeds, or Muktapishti (powdered pearl) can be added to increase the cooling properties of the gulkand. This is a lengthy one which takes time.Hence for preparing instantly i prepare it in a instant and easy way which is given below..check the below proceedure which i prepare..It stays fresh for a month when preserved in a fridge..
Benefits and uses Gulqand is an Ayurvedic tonic. This includes reduction of pitta and heat in the body, a reduction in eye inflammation and redness, strengthening of the teeth and gums, and the treatment of acidity. Gulqand is commonly used as an ingredient of Paan, a popular dessert and digestive of India, Pakistan and Bangladesh.Even milkshakes can be prepared using this one.. Grind the rose petals to a coarse paste,by adding half a cup of water. place them in a pan,add sugar and also add dried rose petals,and cook them on medium heat till thick . Switch the stove and remove from fire.Let it cool and store in a dry bottle. Use it in preparing kheers and rose milk etc..
Aromatic,exotic n so elegant ~ love it very much !Thanks for sharing Kanthiji. 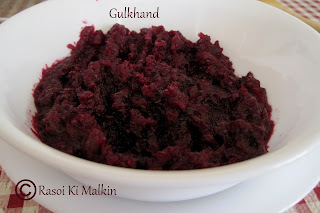 Wow...Really love it..and its so easy to make..
Gulkhand looks very inviting and flavorful. Excellent preparation. Wow flavourful gulkand looks fantastic..